So here is the scenario. You are looking through your scope and find a new object, like a supernova, or comet or asteroid. How do you report where the object is located so that other amateurs, or professionals, can find it too? The answer is to pinpoint the object, not just in the constellation that is near to it, but by its Right Ascension and Declination. These parameters can be used by any astronomers anywhere in the world to be able to point their telescope at the target object. To determine those parameters you need the time of observation and some help from astrometry. Let's start with the image of Ursa Major from last week and assume that some star in that same field of view is our new object. Then using a combination of your available astrometry software packages, in my case AIP4WIN and Megastar Star Catalog, we can estimate the RA and Dec of the target object. 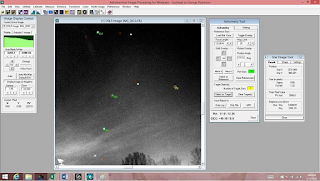 We start with the image of the object as shown in the first screenshot attachment, which shows the Big Dipper, and red circles, which are imported from the star catalog. The process is to align the red circles with the star images in your observation. Once this done, then you can determine the absolute position and location of any of the stars or other objects in your image. 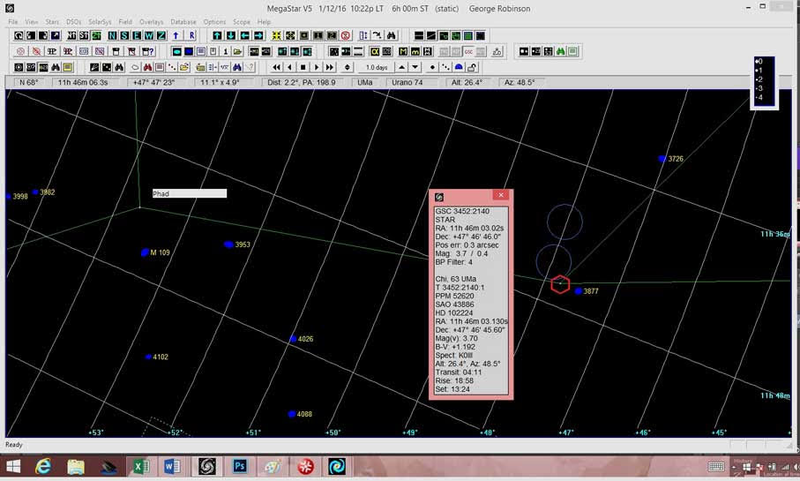 Based on the known star catalog locations, the software can estimate the target object RA and Dec. So look at the first image and identify the stars that make up the Big Dipper and the red circles that were imported from the star catalog. Once you have aligned these two images, the software can be used to measure the location of any other object in the astrophoto. These target object was just chosen as some arbitrary star, here labeled as T1, which enables quick verification if the estimated location actually matches the actual location. The second attached screenshot shows the final star catalog map of the object. I've marked the target object with a red hexagon. 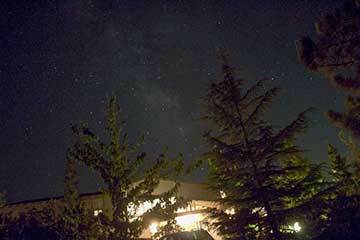 The closest star in the Big Dipper is Phad. The data window shows the parameters of the selected target. 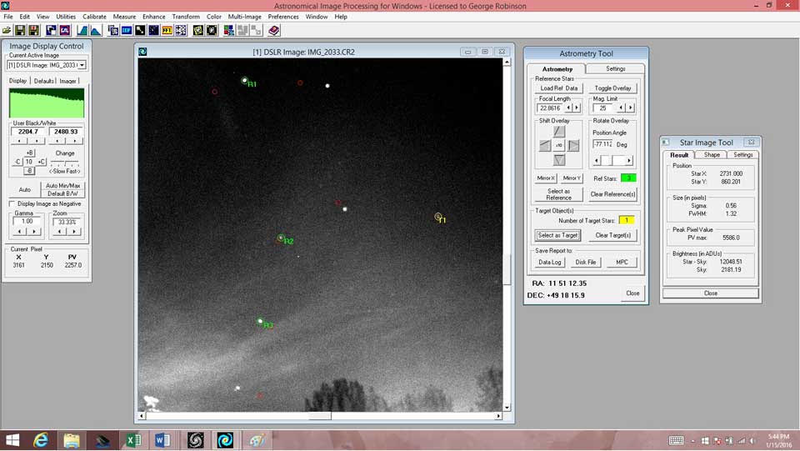 The two light blue circles are my first two attempts at estimating the RA and Dec of the object. The blue circle furthest from the target is my first estimated position. The estimated location is at the center of the circle. When I first saw how far away from the target I was quite disappointed, since the measured value was so far away from the target. You can't do science if your measurements are way out of whack. In reviewing why the error was so large, I noticed that most of the error was in Right Ascension, which is mostly determined by time, so I checked the time values used in the calculation. The camera clock was running just slightly less than one minute ahead of local time. That should be fine. Then I found that the time used to calculate the star catalog positions was 10:00 PM, but the Big Dipper image was actually taken at 10:22 PM. How did this difference occur? Well, I guess it was just my amateur careless mistake, which I will be more careful next time. This difference in time could be why the predicted position was so far off. So, I recalculated the star catalog star positions and realigned with the image and then remeasured the position of the target. The second blue circle, which is. Inch closer to the target, shows the improvement. Once the methodology is worked out, I can go from any observed object image to its location in the night sky bey massacring for recognized stars k. The star catalog to the observed object. Now using the standard convention of separating hours, minutes, and seconds with a space between values and similarly for degrees, minutes and seconds for Declination. So the error is is about 1.5 minutes and 11.5 minutes. This is not bad for a first time estimate, but how does it compare with the error that is possible by other amateurs? By the way, the measured magnitude of this star is 3.70, just the same as its published catalog value. Again I think this is going to be another learning experience when I find out how well other amateurs are able to do this. Any thoughts or ideas on what the accuracy and measurement accuracy is or can be for amateurs? I had hoped that the predicts location would have been right on top of the actual location. What lesson have I missed here? We will have to wait and see. In the meantime I'll be busy next week at the Systems Biology conference in La Jolla and the Quantum Summit in Pasadena the week after. When will I have enough free time to do more astrometry or even play with my new spectrometer, which arrived last week? With new Astronomer Assistant Ruby running around and taking up so much time and free energy, it's hard to concentrate on anything for more than a few minutes. Finally, for all you long term planners, you should consider attending the American Physical Society April meeting in Salt Lake City. I went to school there, 40 years ago, and it will be neat to get back there again for a visit. The big news at the APS meeting, beside having a chance to be surrounded by a couple of thousand physicists, is that the rumor is that there might be a big announcement about the LIGO team and their hunt for gravity waves. My friend, Searching for Gravity waves, Dr. Gary, will be there and we will have a chance to get together again. So if you're Interested in being inundated by physics discussions pack your bags and come to Salt Lake.